The Strokes (1998-present) is a Rock band from New York, New York, USA. 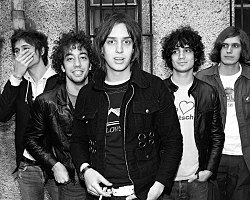 ormed in 1998, The Strokes would feature the membership of Julian Casablancas (vocals), Nick Valensi (guitar), Albert Hammond Jr. (guitar), Nikolai Fraiture (bass) and Fabrizio Moretti (drums). The Strokes would prove to be part of an indie/garage rock revival movement that was sweeping through the industry and specifically New York at the time; a time that saw rock music in the doldrums in general. Their debut, Is This It (2001) gave them hit status and critical acclaim. There were different releases of the album, however. The UK version featured a silhouetted black-and-white photo of a gloved hand on a woman's naked backside, while the North American version featured a photo of particle collisions in the Big European Bubble Chamber. Furthermore, 'RCA' replaced the track New York City Cops with When It Started, as the former featured lyrics in the wake of the September 11 attacks that might be taken out of context. The track in question, New York City Cops with the lyrics, "New York City Cops, they ain't too smart" was listed as No. 12 on New York magazine's "Ultimate New York Playlist" years later on March 1, 2010. Room on Fire followed in 2003 to equal acclaim but less commercial success. Nonetheless it still managed Gold. They made the cover of Rolling Stone for the first time with this release while other media coverage came from the relationship between Moretti and actress Drew Barrymore that would come to its conclusion in January 2007. In November 2003, The Strokes played on the late night television talk show Late Night with Conan O'Brien, performing Reptilia, What Ever Happened, Under Control and I Can't Win. In late 2004, a live album, Live in London was planned for release, but was abandoned, reportedly due to recording quality problems. In late September 2005, Juicebox, the first single from the yet unreleased third album, was leaked online, forcing the single's release date to be advanced. The single was released as an exclusive to online download services. Juicebox became their second UK Top 10, as well as their second US Modern Rock Top 10. That third album finally appeared in the form of First Impressions of Earth (2006) to mixed reviews receiving a 1 UK/4 US; their first UK 1 charting. In 2006, the band played 18 sold-out shows during their UK tour. Angles (2009) would be different from the first three in that it would feature music written all the Strokes members, rather than Casablancas writing ninety-five percent of the material alone. The act would then be featured at just about every major festival of the following year. Comedown Machine (2013) then followed after several years of touring and a brief break from the scene. Photo by: Roger Woolman - The Strokes by Roger Woolman.